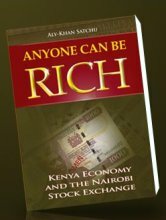 If the current rush for shares in the stock market fascinates you and you are tempted to plunge into the business, then the latest trading guide,'Anyone Can Be Rich: Kenya Economy and the Nairobi Stock Exchange', is for you. Along with a chapter on guiding principles, the new book written by Mr. Aly-Khan Satchu takes readers through the structure of the N.S.E, investment methodologies and gives minute details of expected performance of individually quotes companies. It provides guidance on how to trade in shares. He tells investors to be disciplined, conduct research and pay attention to detail. He warns that the market can be a merciless judge, and investors should never accept what an 'expert' tells them blindly. The book states that "every day, the efficiency of your judgement goes on trial. If your judgement is good, then you will consistently make money. But if your judgement is bad, then your survival depends on Lady Luck, which, at best, will usually serve you for only a while." Born in Mombasa and educated in England, Satchu is an old hand in the money and comodity markets of the U.K.